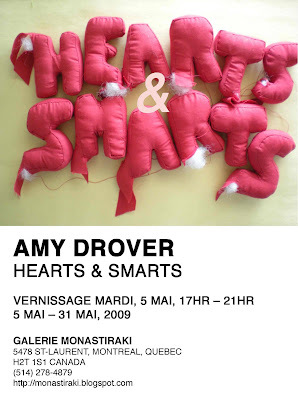 For her show at Galerie Monastiraki, Amy has created a body of work that draws together ideas of play, pattern and perverts. Using her skills as a d.i.y. sewer she makes banners, embroideries and 3-D plush letters to spell out stuff that is funny and sweet and dear to her heart. Amy Drover is an artist living in Toronto who works in a variety of mediums. She makes fibre-based art, multiples of books, buttons, and finger puppets. Amy gravitates towards the homemade, handmade, d.i.y. techniques of silk-screening, embroidery, sewing, knitting and crochet. She often finds herself making performative work that involves baking, comedy and humiliation. She attended Concordia University where she completed a BA in English literature and studio arts. Her art practice continues to evolve as she digs deeper into her research and obsession with graffiti art and the history of repeat printing.